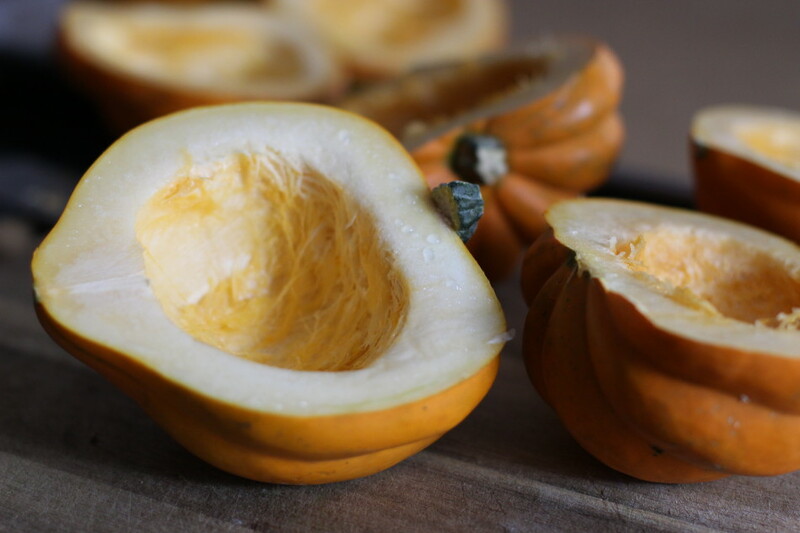 Of all squashes, acorn squash usually gets a bad rap. It seems that butternut and pumpkin are the fall favorites with all the attention they get while they’re around. 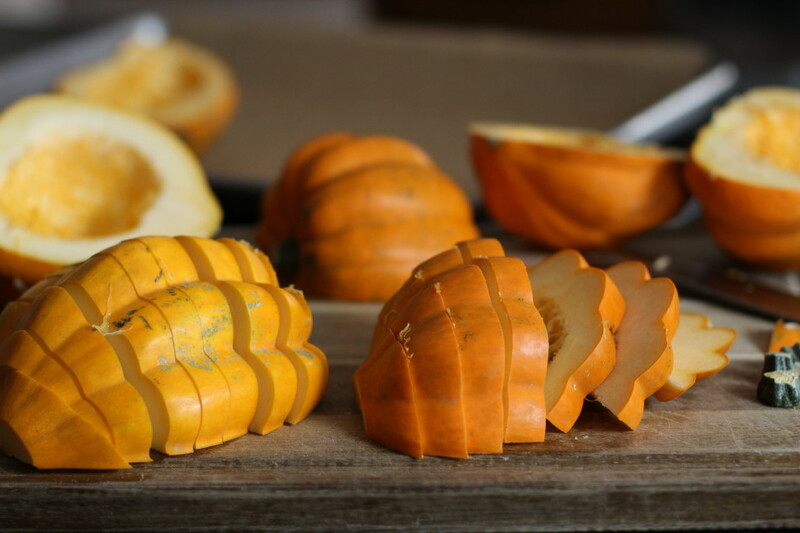 But don’t forget how this funny looking squash has all the versatility and somewhat peculiar flavor as its’ cousins.This tipsy, ridged winter squash may have a hard rind exterior, but what lies inside is a slightly nutty, milder flavor than say, butternut, and pairs well with many spices. It’s also delicious stuffed and baked with rice, quinoa, or chopped meat as well chopped up and thrown into stews (skin is edible). If you haven’t bought any yet now is the time before they are gone. It’s delicate, and sweeter flavor (more so than other winter squash due to it’s longer growing period, giving it plenty of time to soak up the sun) had me wondering, why haven’t I been cooking this more often. Some may say only select the dark green ones, yet the orange ones yield just as delicious results. There are also speckled varieties that taste a little sweeter. All are terrific for roasting in the oven. 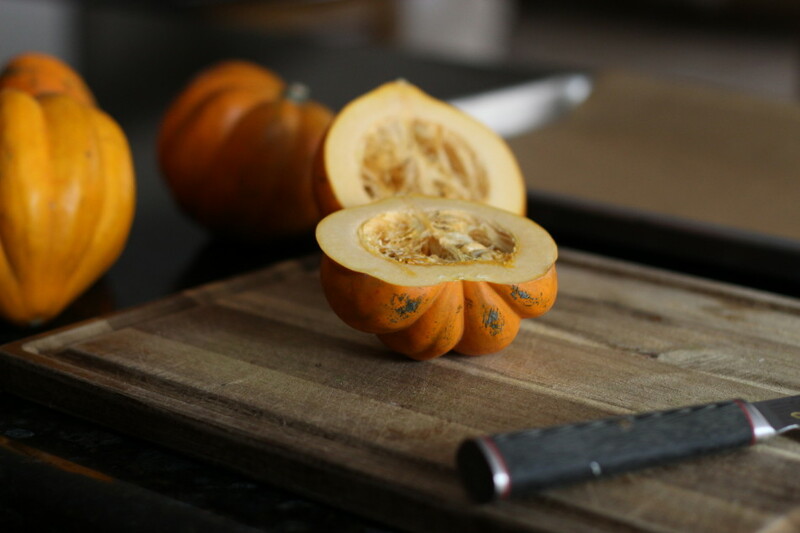 Overripe squash can be stringy, they usually have wrinkly skin, and can be easily squeezed. Squash should be very firm, without blemishes, which could mean spoilage. The warm-spiced squash along with the coconut yogurt, tart pomegranate seeds, and a little fresh cilantro, takes this winter squash to a whole new level. 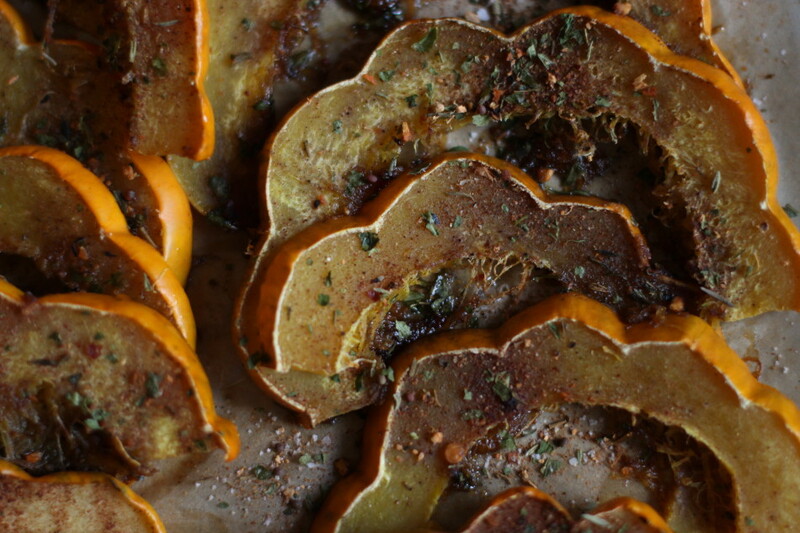 I hope you give this spiced acorn squash for its’ flavor and how easy it is … until then, enjoy! Note: the spices above are an adapted version of garam masala, if you have garam masala then use that in addition to thyme. Prepare two baking sheets lined with parchment paper. 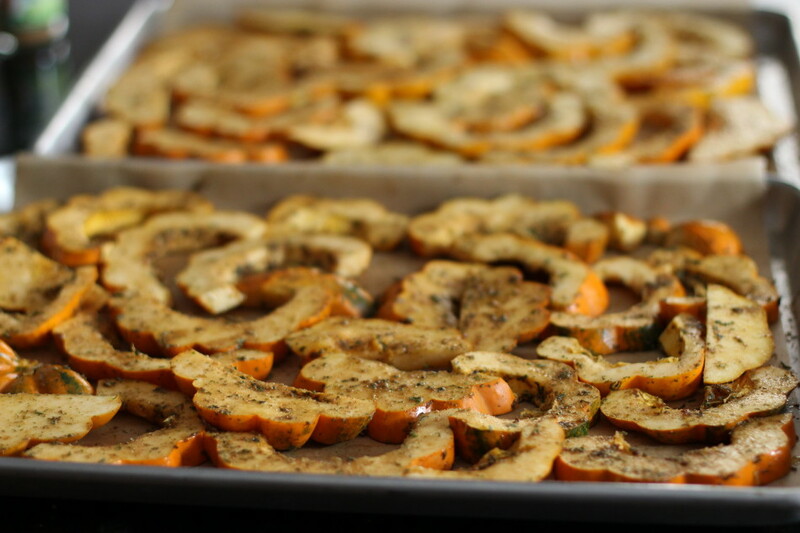 Wash outer skin, then cut the squash in half (lengthwise) and remove seeds. Slice about a 1/4 inch thick. Transfer onto the baking sheets. Drizzle with olive oil. Combine salt and all the spices in a small bowl then sprinkle evenly over all the slices. Rub the slices and toss by hand to full coat all the slices. Bake for 30 minutes. For make ahead: Do not freeze after it has been cooked, it will become soggy. 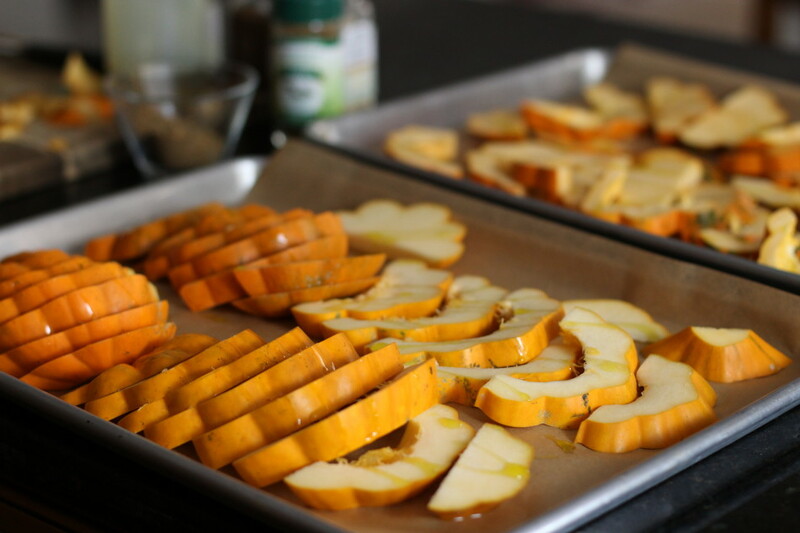 Instead season sliced squash then freeze. After it has thawed drizzle with olive oil, toss to combine and bake. 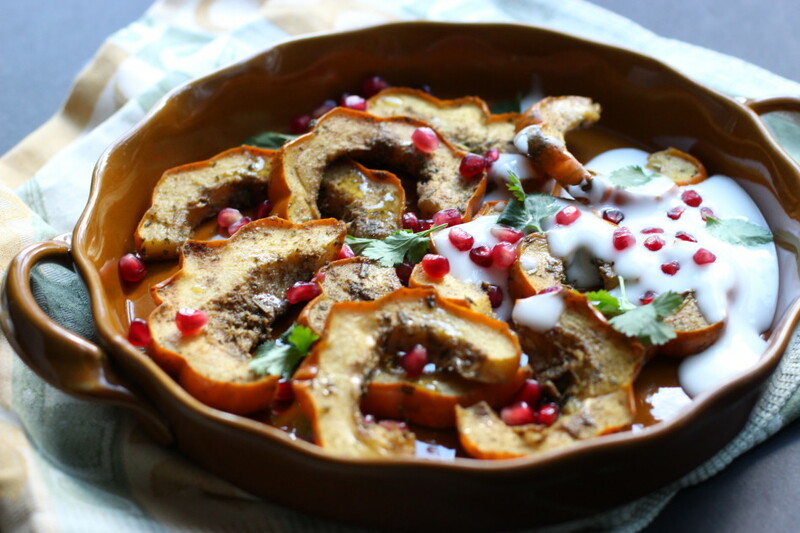 The squash looks delightful with yogurt and pomegranate seeds. I'm getting hungry! I make acorn squash often and love it, so does my family. I can't wait to try this with the warm spices, sounds so delicious! I love to make squash stuffed with quinoa, chicken and vegetables. I haven't tried it with the spices in your recipe yet, looking forward to it!! 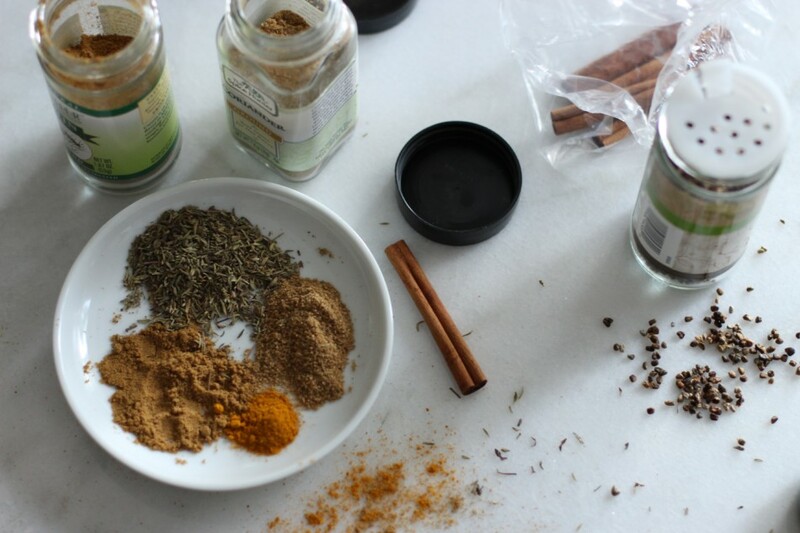 Ronnie, If you like the spices in a garam masala you will love this, enjoy! Jessica, this looks amazing!! 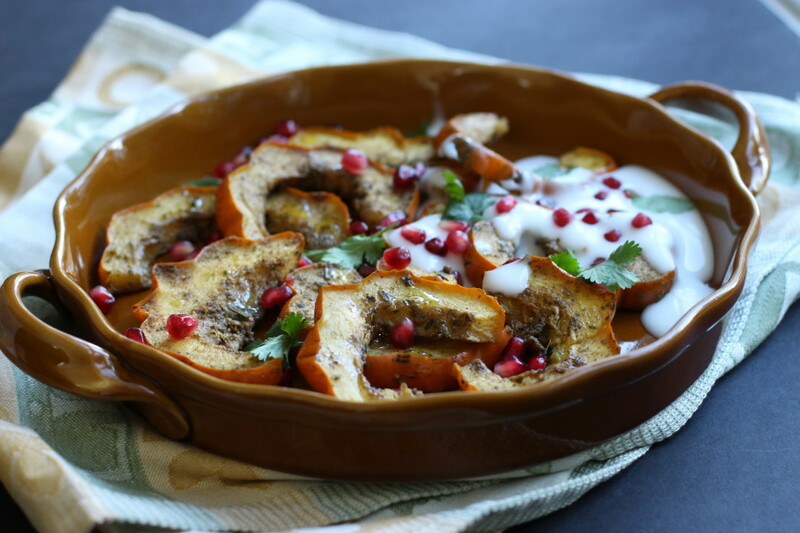 I would never have thought to slice up acorn squash and have it with coconut yogurt and pomegranate seeds. OMG I have to try this! I will admit I have never tried acorn squash and I don't know why, I guess I haven't really come across it and growing up my mother never made it. It looks really good. How would you compare this in flavor to butternut squash? This reminds me of a Moroccan dish my husbands family makes ; they don't use thyme instead they use garlic and ground ginger in their spice blend and serve it with lamb. This looks like a delicious meat free alternative, and so beautiful! 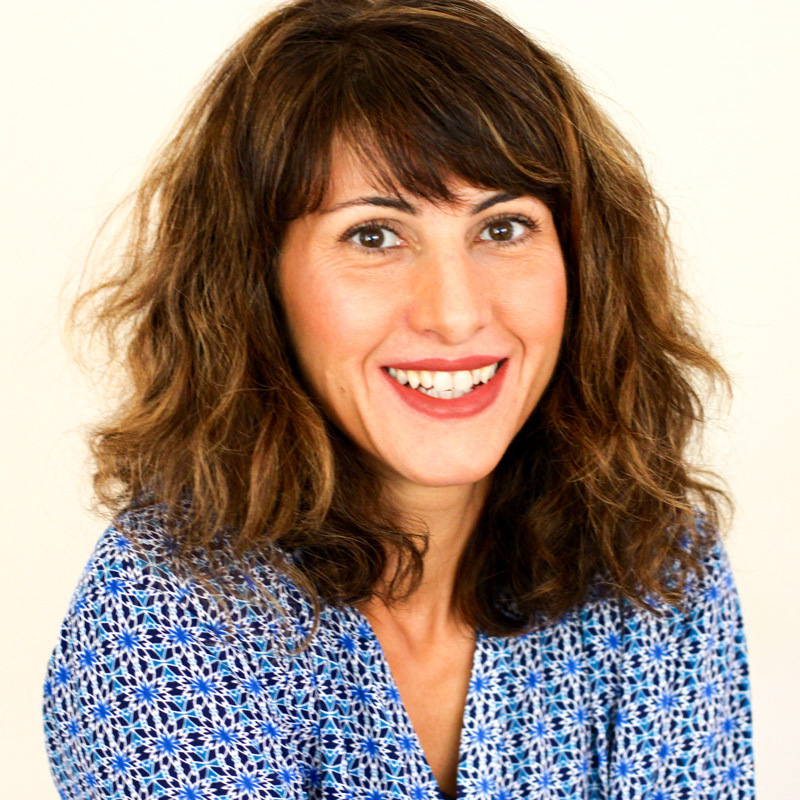 Your so welcome Mouna, enjoy! I love the spices in here, and the coconut yogurt looks like greek yogurt. What brand is that? My daughter cannot eat dairy anymore. I think she would love this to take to work. Thanks! The brand is: So Delicious, plain flavored. It tastes similar to a greek yogurt, just a bit thinner and a great substitute to greek yogurt. Enjoy! I love to make any kind of squash and this looks really yummy with yogurt and pomegranate seeds. I think some honey and toasted almonds added to this would go well with my roast chicken. Dinner is served! Thanks for the recipe! I found the spices to go very well with a drizzle of maple syrup, toasted cashews and pomegranate and delicious with pork chops. I couldn't find the coconut yogurt but it was still delicious with the spices on the squash. I would definitely make this again!